MESA, Ariz. (AP) Back home in Las Vegas this winter, Kris Byrant finally understood just how much the Cubs championship meant far beyond the Windy City. He felt the constant love from fans just by seeing people in the streets wearing Chicago gear. Or when many recognized him and offered congratulations for his huge part in the franchise’s first title in 108 years. He’s hard to miss at 6-foot-5, too. Jake Arrieta gets it. He experienced the same thing, and he can’t always hide behind his signature bushy brown beard. Now that this group has its banners and baseball’s bragging rights until a new winner is crowned next fall, the Cubs want to do it again. Keep flying that W in Wrigleyville. No doubt the fanfare has reached the Arizona desert, where the Cubs were a main attraction in Mesa when they formally began 2017. Manager Joe Maddon has a firm but good-natured message. He is encouraging the Cubs to stay ”uncomfortable,” to keep pushing. He absolutely believes the ”psychological crap” he speaks of matters greatly. Bryant has repeatedly re-watched the jaw-dropping 8-7, 10-inning Game 7 win against Cleveland and also a film on the Cubs ending their drought at long last. Arrieta’s spring start was immediately a success. ”I’m glad to have the blood test done. 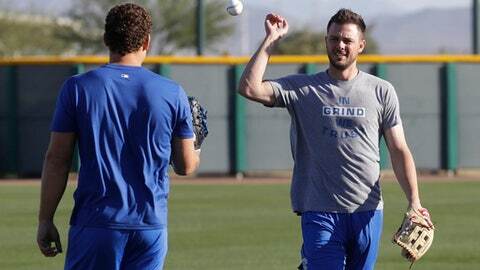 I didn’t pass out this year, which was nice,” the ace right-hander said. He loves the energy surrounding the team from every angle.